This Thanksgiving, leave the turkey to Michael Lachowicz, the talented chef/owner of Restaurant Michael. Enjoy a Family Style Traditional Dinner at Restaurant Michael with Roast Organic Turkey, Roast Tenderloin and all of the Thanksgiving fixings 1 p.m. – 4 p.m. Thursday, November 26. This family style meal is $45 per person, children 10 and under are half-price. For those wanting to stay at home, Restaurant Michael also features “Thanskgiving To Go,” a hot and ready to serve carry-out version of the same menu for $49 per person. To go orders must be picked up between 1 p.m. and 4 p.m. on Thanksgiving Day. Both Turkey Day menus feature two main entrees, six side dishes, two desserts, soup, salad and bread. Restaurant Michael is open regular hours for the entire holiday weekend. Restaurant Michael features a Christmas Eve four-course prix fixe dinner with a choice of four dishes for each course for $52 per person. Children 10 and under are half-price with half portions of the dinner which runs 4 p.m.- 8 p.m. on Thursday, December 24. Just like Thanksgiving, Restaurant Michael features the “Christmas To Go” menu available for pick up on Christmas Eve between 2 p.m. and 4 p.m. The carry-out four-course dinner is $49 per person. Restaurant Michael is closed on Christmas Day, but open regular business hours for the remainder of the Christmas week. Restaurant Michael is also open regular business hours during the weeks of both Hanukkah and Kwanzaa. Ring in the New Year with Restaurant Michael, featuring a four-course prix five menu. Early seatings are $79 per person and feature a glass of Tattinger Champagne with dessert 5:30 p.m. – 8:30 p.m. Reservations are taken every 30 minutes all night. Later seatings feature a five-course menu as well as Tattinger Champagne with dessert for $89 per person, plus party favors for the midnight celebration. Live music featuring a two-piece band plays 7 p.m. to 12:30 a.m. all night. Restaurant Michael is closed New Year’s Day, but will have regular hours the remainder of the weekend. 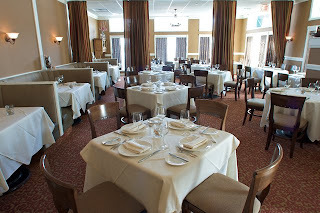 For more information or to make a reservation, call (847) 441-3100 or visit http://www.restaurantmichael.com/.